Just an update on my last post "New Project for Our Collection"; I have done three things with our "new" sword. 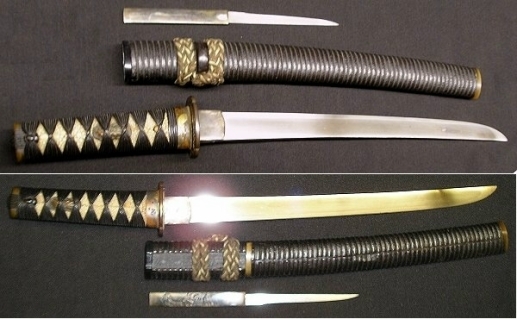 First, I decided to restore, instead of replace, the original tsuka. The break was very clean, and easily repaired; the missing section of wood on the omote side of the wood core was replacec by a laminated insert that I made from several sections of a thin sheet of veneer wood that I was able to cut, stack, and fit into the open section. 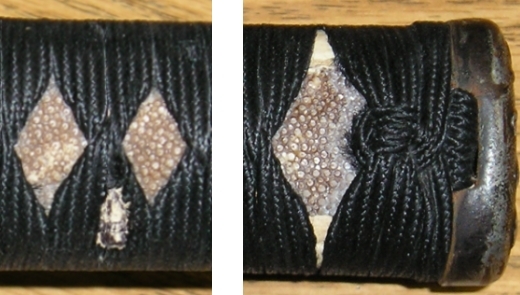 In addition, the residual rust deposits from the nakago on the interior of the tsuka cleaned out nicely (see photos below). Below is a fron view of the insert. 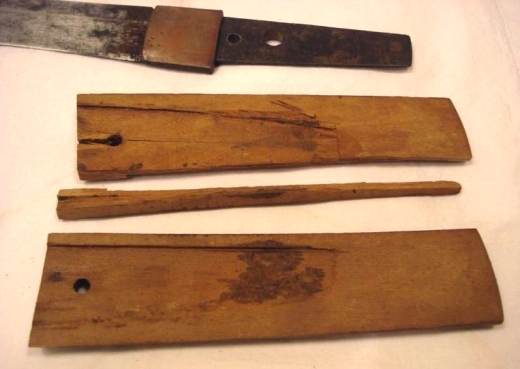 Next, I replaced the single seppa with a matching set that I fitted to the blade (see seppa in photo below). 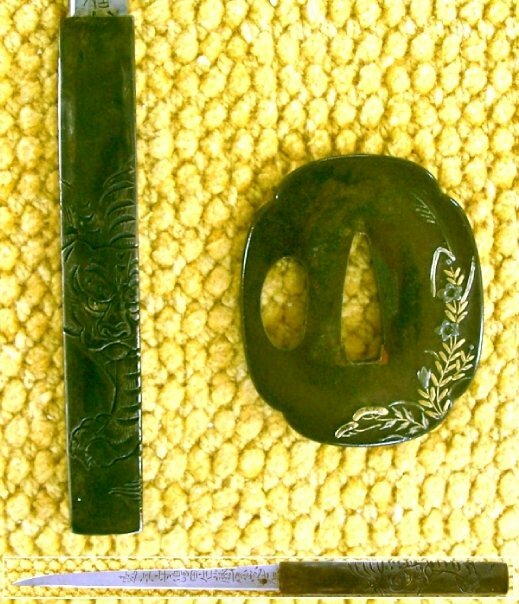 Finally, I am thinking about replacing the original tsuba (the plain shakudo one on the left in the picture below) with an extra one from our collection that compliments the rest of the mounts in color, theme, and materials (the iron tsuba with gold, silver, and shakudo in-lay on the right). What do you think? 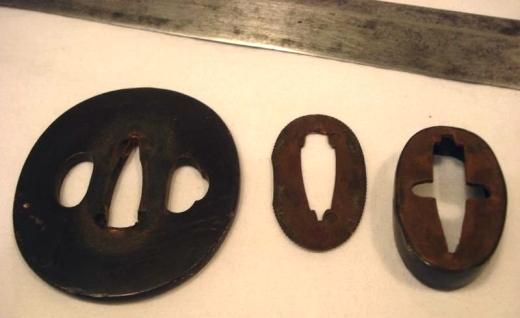 Which tsuba do you think goes best with these mounts? 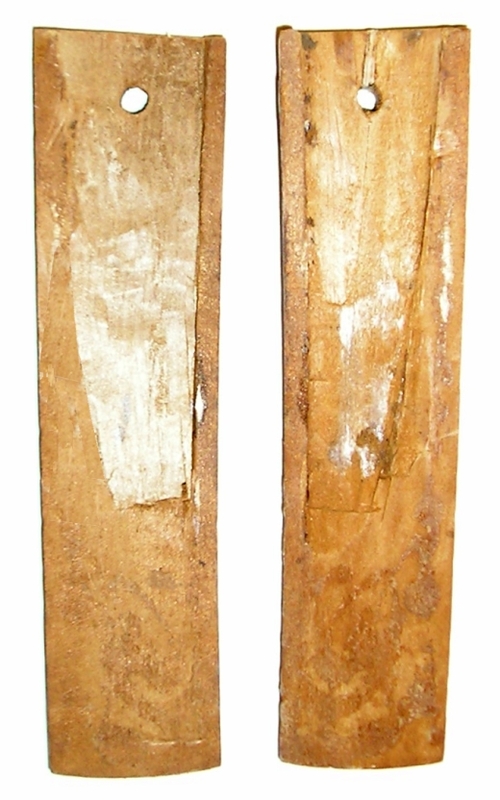 This is a blade that we recently acquired for our collection. I thought it would be interesting to track its restoration progress here on my blog. At this point, I can't tell you too much about the blade or the fittings, and, aside from the fuchi, tsuba and habaki, I'm not sure if I will be keeping any or all of the current koshirae. All I can say is that I see potential. The photos below were supplied by the seller, let me know what you think. I took a few blades out of storage this morning for their scheduled cleaning and oil. The tsuka of one caught my eye, it was rewrapped by a former student last May, and I hadn't really looked at since I put it away two months ago... Seeing it again gave me a fresh look at this student's first tsuka. The story goes like this, last Spring I was given the opportunity to introduce a student to tsukamaki. 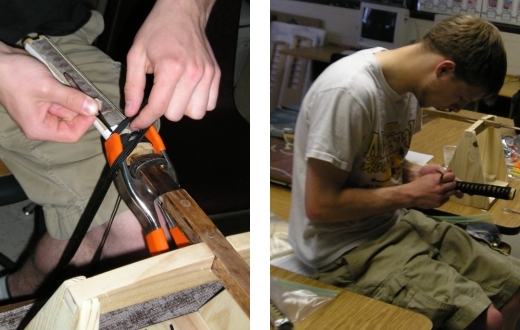 For his Senior Project topic Jake Wright chose to investigate Preservation / Restoration of Japanese Arms & Armor. Among other things, he was specifically interested in the fundamentals of tsukamaki. Using the tsuka of a Gendai blade in civilian mounts from our collection, I was able to supply him with the tools (a traditional maki stand, clamps, picks, etc. ), and the materials (tsuka, ito, paper, etc.) to complete this aspect of his project. I was VERY impressed by the final product, especially when you consider it was his first tsuka! Personally, I think his work is equal to, if not better than, the original. Nice job Jake! 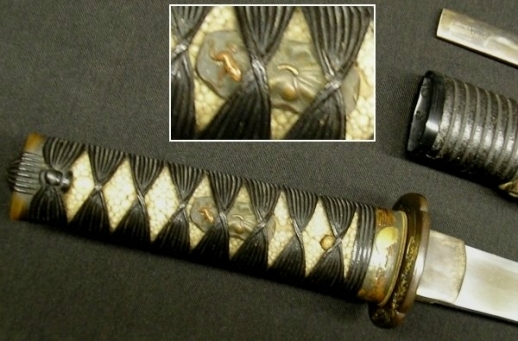 I have posted a few additional pics of the blade and koshirae below. 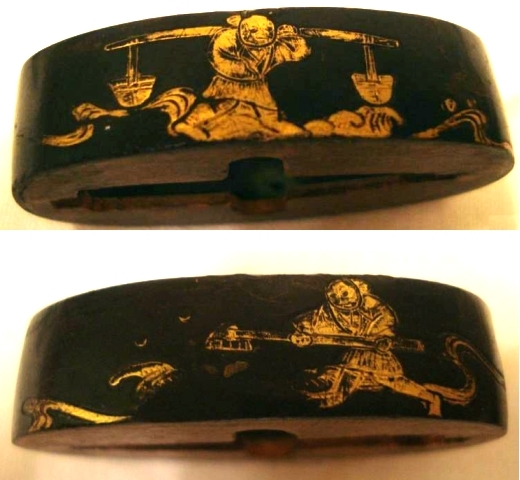 Except for the new ito, everything is original (saya, fuchi/kashira, menuki, tsuba, etc.) and I believe the blade is still in its first polish. On a side note, Jake will be starting classes at Gonzaga Univerity in Spokane Washington this Fall. Following the theme of paper ito, here is an interesting study piece from our collection. 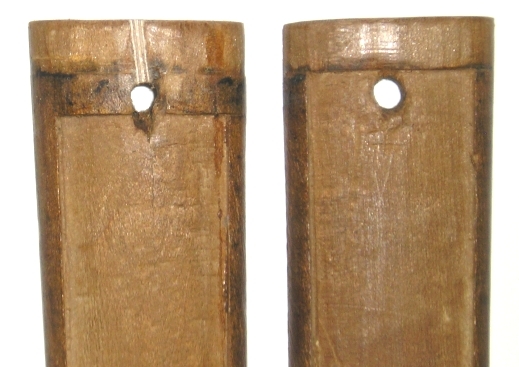 It combines both lacquered leather (saya), and heavily lacquered paper ito (tsuka). For a long time I thought both were leather, but upon closer examination I was surprised to find that the tsukamaki in fact has a paper base. 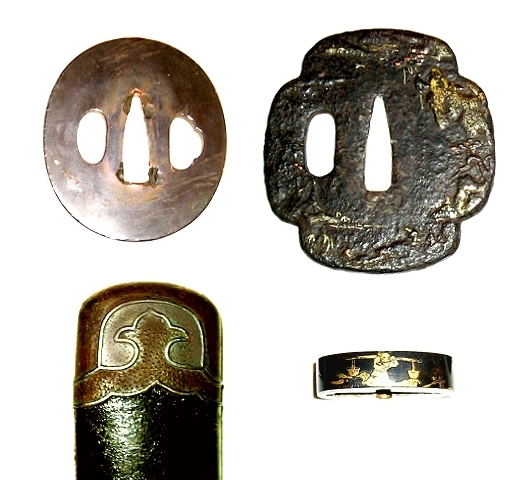 Anyway, here is a description of the mounts: O-tanto; lacquered paper tsukamaki & lacquered leather sayamaki; fuchi is mixed metals w/ a rising sun & clouds motif; menuki are shakudo w/ frogs on lilly pad motif; tsuba is copper/shakudo w/ silver & gold inlay in a floral motif; silver kozuka with tiger motif. Here is a closer look at the tsuka. Although in a couple of spots the same' has cracked, and is missing several nodes, over-all the maki is still very tight and solid. 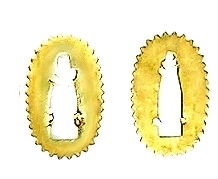 Also, notice how the omote knot above is asymmetrical, this is common on a number of tsukamaki styles, such as (a) Hosojabaraito Kumiage Zuka, (b) Ganpi (Kigami) Maki, and (c) Kami (Hosoyori) Hiramaki Zuka shown below. 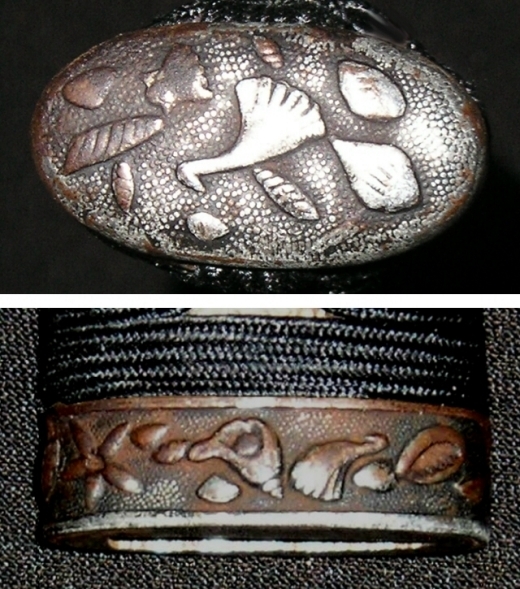 Finally, below is a close-up of the Kozuka and Tsuba... Like most collectors, I love to share. What do you think?